My Husband is Attracted to My Girlfriend. What Can I Do? Book Give Away: The Emotionally Destructive Relationship. Plus see winners from previous Give Away. Most individuals who regularly use manipulative tactics do not intentionally set out to do harm. They may not even be aware that their relational style is one of manipulation. It is what has worked; it is what they know. Healthy people engage in dialogue where they discuss, negotiate, compromise as well as respect one another's differences, feelings and desires. A manipulator pushes and pressures to get his/her own way by ignoring stated or implied boundaries, trying to get you to back down, make you feel guilty or afraid so that you will give in and give them what they want. "If you don't sign for this home equity loan, I will lose my business, and it will be all your fault." "Donna's husband says she doesn't mind that he is professional friends with other women. What's wrong with you?" "Everybody else can go to the party; why do you have to be so controlling?" "I guess I'll manage if you can't come over to help me today, but I don't know how." "I thought you loved (cared about) me. I guess I was wrong." "You said you would sign for the loan." (When you only said maybe you'd sign for the loan). "You told me you would support me in my business, and now you're not." "Jesus said that we're to forgive and forget the past. Why do you keep bringing it up?" "God says I'm the head of the home. Why do you keep questioning my decisions?" "If you don't sign that bank loan, you'll be sorry." "If you don't forgive me and take me back soon, I'm filing for divorce." "If you leave me, I'll take the kids, and you'll never see them again." "If you don't shut up right now, I'm going to leave." "I just want to talk with you. Why can't we talk? I only want to talk with you. I only want 10 minutes of your time (which stretches into hours if you allow it) to talk to you." "Why can't you come to our house for the holidays? It would mean so much. You know dad and I aren't getting any younger. Everything is going to be there. Please come? We'll really miss you. Why wouldn't you want to come?" "I need you so much right now and you don't care." "I can't talk to you, you just don't understand." These forms of manipulation are often more non-verbal, the silent treatment, bad moods, nasty eye contact, uncontrollable sobbing, banging things, slamming doors, etc., until you give in and do what he/she wants. "I can't believe what I'm hearing. This is not the person I knew. What has happened to you? You used to be such a wonderful person." "You're such a jerk. I can't believe I married you." "You're an idiot--a real moron." "I thought you were a Christian." "You're crazy, (sick). Everyone else agrees with me." "I'll never do that again, I promise." "I will take care of the kids on the weekend; just let me go out tonight." "You don't have to come next Thanksgiving, just come this Thanksgiving." "If you let me back home, I promise I'll go to counseling." "You know you're supposed to submit and do what I want you to do." "God hates divorce. You're sinning if you divorce me." "You are to honor your father and mother. That means you should come to Thanksgiving at our house." "The Bible says you should forgive and reconcile. You're disobeying God." "I don't know what these charges on the credit card or cell phone bill are for; it must be a mistake." "It's just a friendship, nothing more." You will never change the manipulator when you confront their manipulative tactics directly. They will just switch to another tactic. So if you want to change, change begins with you. 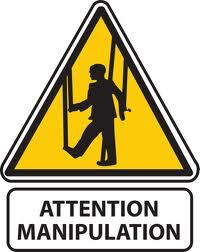 You must recognize that someone is attempting to manipulate you. Are you an easy prey for manipulators? Why or why not? I am so excited to roll out my new website to you in a few weeks. We hope to have it up and running by the next newsletter mailing. We've been working hard to get the pieces in place. The new website will be refreshed and easy to use. When my new website is up and running, we will be switching to a new host site for my newsletter. Therefore, we will be asking you to re-register for my newsletter. Everyone who re-registers will get a very special free gift. Do you want to change? Within the pages of this book, you will find biblically sound, straightforward help to take the first step today. by Friday, July 13th for a chance to win one of two copies! Congratulations to Stephanie S. of Troy, AL and Cathy V. of West Windsor, NJ who were the two winners of Lost and Found by Ginny Yttrup. From the very beginning of my invitation to you and then all the way through the process of developing our retreat, you had a warm and flexible spirit that was aimed to serve the lord and our women. You delivered exactly what you said you would and it was so helpful to our women. They not only walked away with a new love to honor and serve God with their lives, but also with some new practical tools of application to be the "best version of themselves." Question: I have been married for 9 years and recently found out that my husband was pursuing one of my friends from church. He told her how he felt and that he was attracted to her. This went on for about 8 months before I found out. From my understanding, nothing happened, but there were two incidents that alarmed her and she felt like I needed to know. However, I don't know if I feel comfortable going to the same church with her knowing that my husband is attracted to her. I don't trust my husband and I really never have because he was unfaithful to me during our high school years. My husband doesn't regularly go to church, but when he wants to come now, I don't want him to because I think it's only to see my friend. He doesn't think he did anything wrong. How can I deal with this in a godly manner? I don't want to leave my church, but I don't know if I can deal with us and her both being there? I love having her as a friend, and he's my husband. What can I do? Please help? Answer: Your husband has put you in a very awkward position. Your biggest problem is in your marriage, not with your girlfriend. It sounds like she was a good friend and she regretted having to tell you of your husband's inappropriate behavior. You may decide to change churches so that you aren't tempted with anxiety every time you see your friend and your husband isn't tempted with lustful feelings; however, it's a short-term fix because you can't control your husband's heart. First, let me just say that if we were totally honest, many of us would admit that sometimes we're physically and/or emotionally attracted to people who are not our mates. But most people who feel that way don't share those attractions or act on them because we love our spouse and don't want to hurt them or dishonor God. Instead, we pray hard and ask God to take those feelings away. We also work harder to rekindle our marriage and the loving emotions associated with our mate. Your husband did not do that and, furthermore, sees nothing really wrong with his behavior even though it hurt you and it bothered your friend. Your problem now is how do you live in a godly way in a marriage with a man you don't trust and who doesn't exhibit a strong commitment to you or your marriage? I love the description of a godly woman in Proverbs 31. One of the things it says is that she brings her husband good not harm all the days of her life. That doesn't require that you trust him or do whatever he wants, but it does mean that you love him with God's love. What would that look like in this case? What is in your husband's best interests? First, it is in his absolute best interests for him to come to Christ. It would also be good for him to recognize his foolish and immature ways. It would be good for him to rekindle his relationship with you and build a strong and loving marriage for your children to be raised. Although you cannot change your husband, you CAN strongly influence him for good or for evil. Wives are encouraged in 1 Peter 3, even if their husband isn't a believer, that by their wife's godly behavior he can be won to Christ. I think many times we blow these moments because we are so angry (rightly so) that we don't think through the powerful opportunity we have to show them what Jesus is like. So, let me give you some ideas of what specifically you might do in this instance. You can refrain from harsh criticism and sarcastic put downs that he may deserve right now, but that won't influence him towards Christ nor towards you but close him down and turn him away. You can pray that God shows him his sin and that God helps him want to be a man who loves God and loves his family. You can speak the truth in love to him, not pretend everything is just fine, nor verbally vomit when you are upset with the memory of what he has done. You can try to initiate fun things to do together to rebuild your marriage. You can try to be easy to talk to and work on being a good listener so that he wants to open up and talk with you. If he continues to disrespect you or your marriage vows, you can set very clear boundaries that his behavior is unacceptable and that, although you want your marriage to work, you do not want to be married to someone who lies to you or betrays you. You can find some wise and godly people you can talk to and who can pray for you because these things are not easy to do when you are mad and hurt. I find that women who can act in a godly way when their husband sins against them have the best shot at influencing their husband to see Jesus and his grace in a real way. That is your hope and God's will for your husband's life. Satan has already influenced your husband's mind and heart; don't let him influence yours too. My book, How to Act Right When Your Spouse Acts Wrong, will give you many more practical suggestions on how to respond instead of react, how to overcome evil with good, how to love in godly ways, how to implement the gift of consequences when someone repeatedly refuses to change sinful behavior and the benefits to you of learning such difficult lessons. My heart goes out to you. This is not easy, but I promise you that if you learn how to act right to his wrong, you will be blessed.